A visually impaired man stands with his guide dog in Grande Parade Square. Supporters gather on the side of the road, encouraging cars to honk. The crowd gets ready to march. 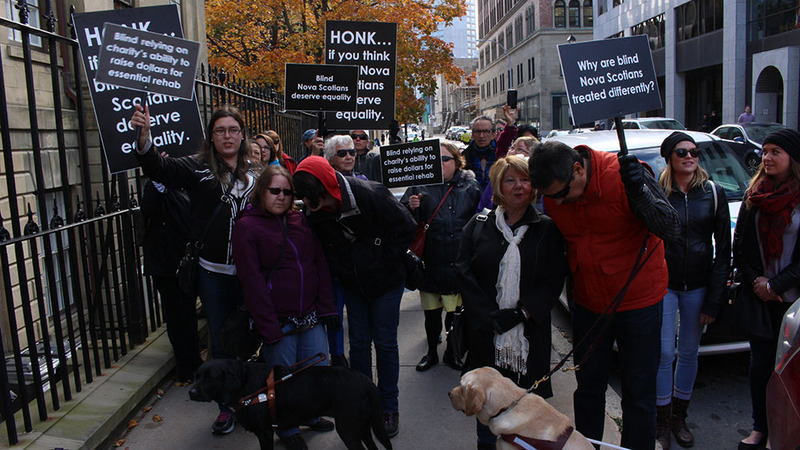 CNIB supporters walk down George Street. The march begins. 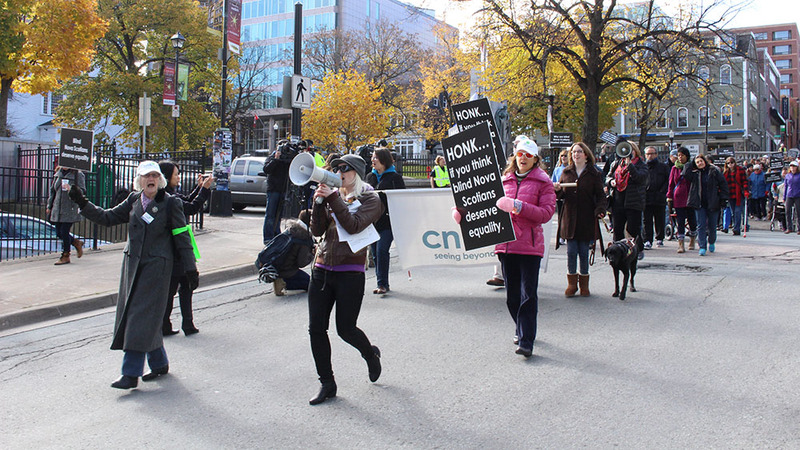 A CNIB banner is carried at the front of the march. 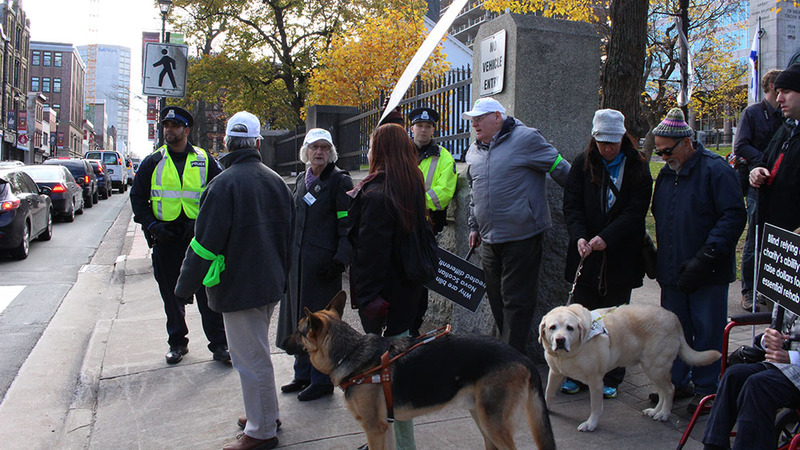 CNIB supporters approach Province House. 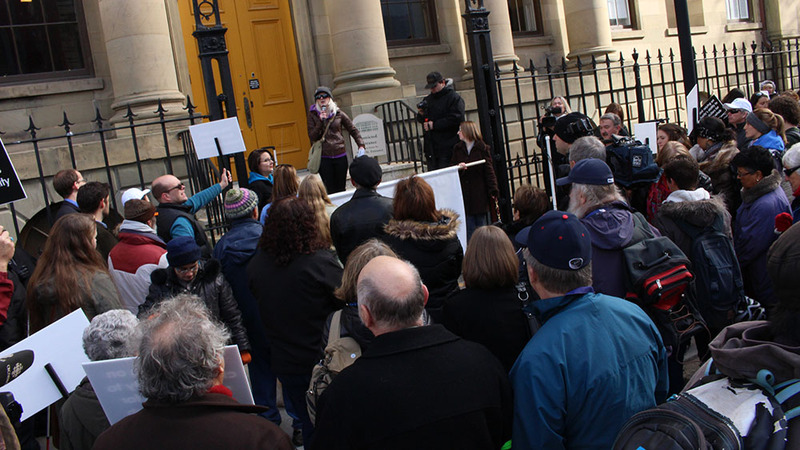 A crowd gathers in front of Province House. CNIB supporters say they want more government funding. Shouts could be heard within Province House for several hours. 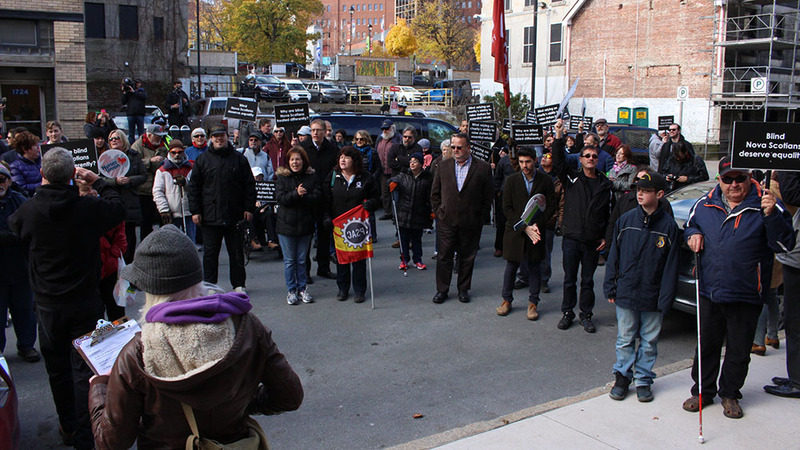 More than a hundred people marched to Province House on its first day of the fall legislature. 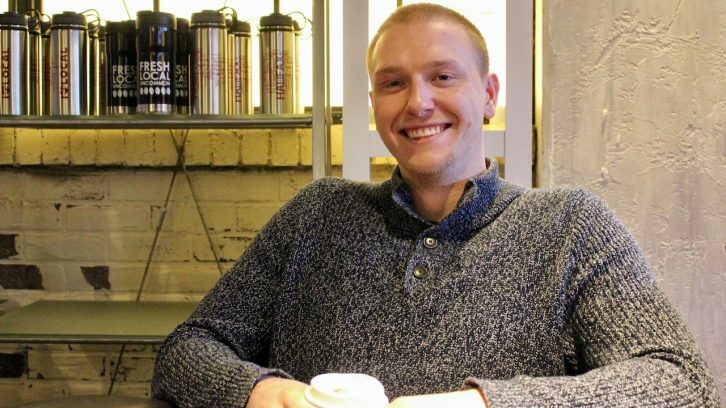 They want the Canadian National Institute for the Blind (CNIB), an organization that works with visually impaired persons, to get its government funding back. Services were cut by 30 percent in Apr. 2015. 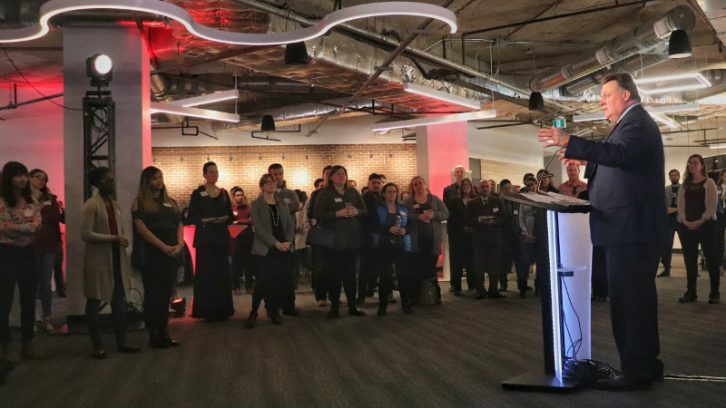 Alycia Pottie, a visually impaired Dalhousie University student, said she wouldn’t be a successful student without the CNIB vision rehabilitation program. Pottie was diagnosed with juvenile arthritis at the age of two. 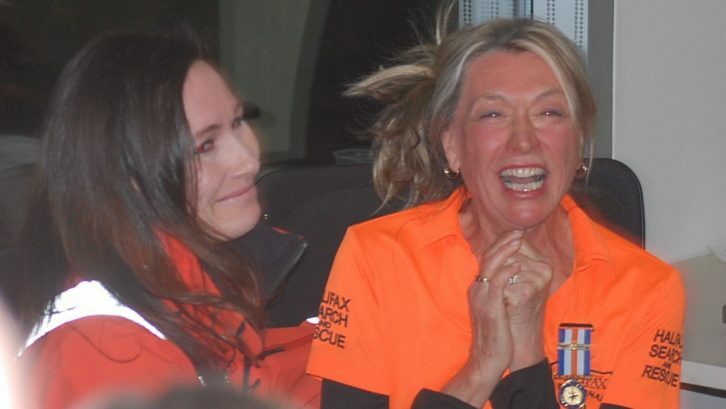 She began losing her vision at four years old as a result of inflammation in her eyes. She told a press conference on Thursday that she suffered from depression before she contacted the CNIB. That changed when she started seeing a mobility specialist through the CNIB program. “I’m an active member of society. I made the dean’s list. I’m a completely different person,” said Pottie. Pottie spoke to Meech Kean and Sara Ericsson from Signal TV. Pottie was joined by visual disability advocates calling for the government to restore funding to the organization that changed their lives for the better. 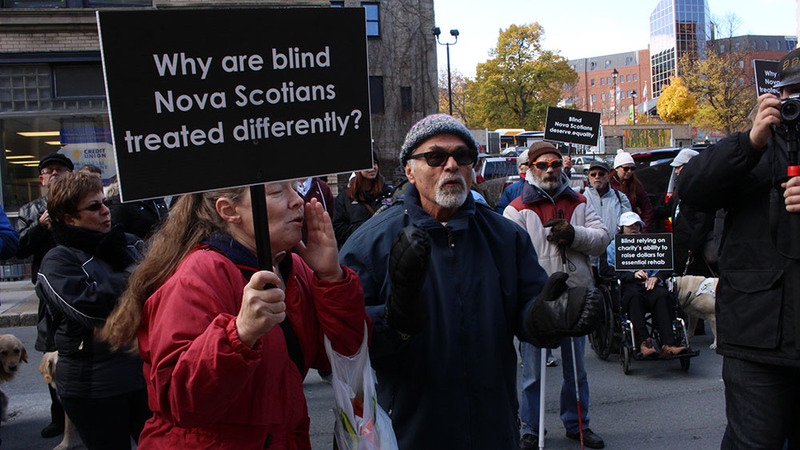 Pamela Gow-Boyd, executive director of the Atlantic branch of CNIB, said the organization is the only one that supports blind Nova Scotians in the province. 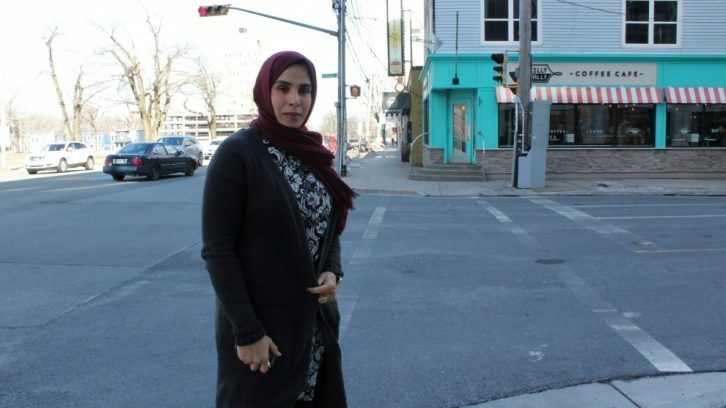 She asked the Nova Scotia government to provide about $500,000 in immediate funds. 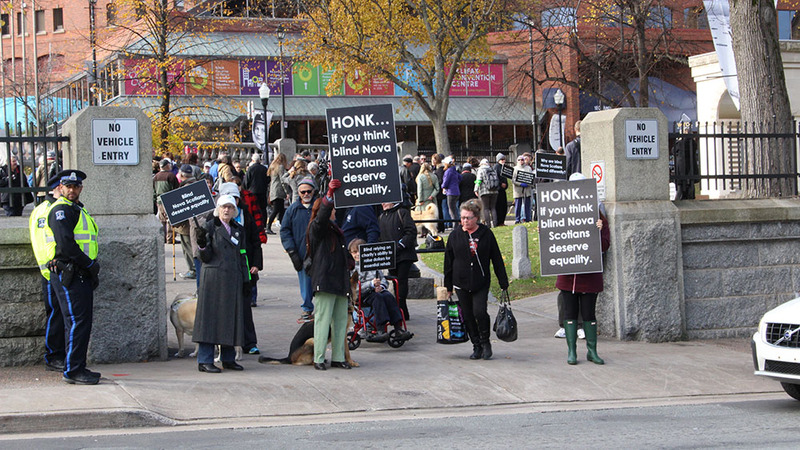 “13,000 blind Nova Scotians are in jeopardy,” Gow-Boyd said. 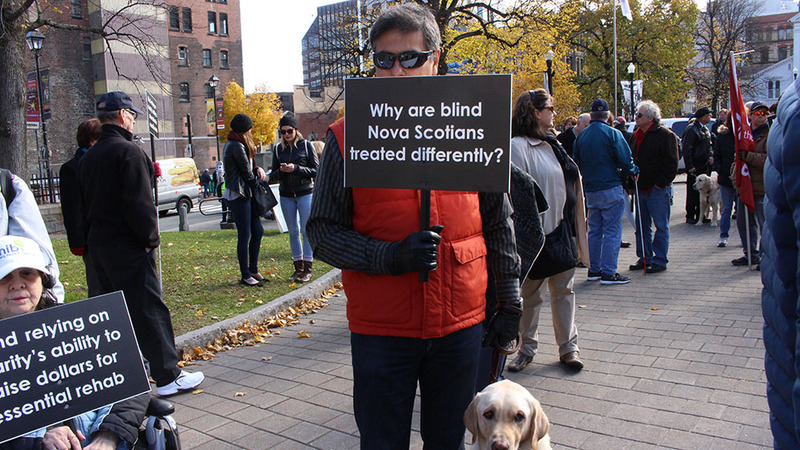 She said without the CNIB rehabilitation program, more visually impaired Nova Scotians would be at risk of physical injury and enter the mental healthcare system for depression. She said that would cost the government more in the long term than it would to re-fund the program. 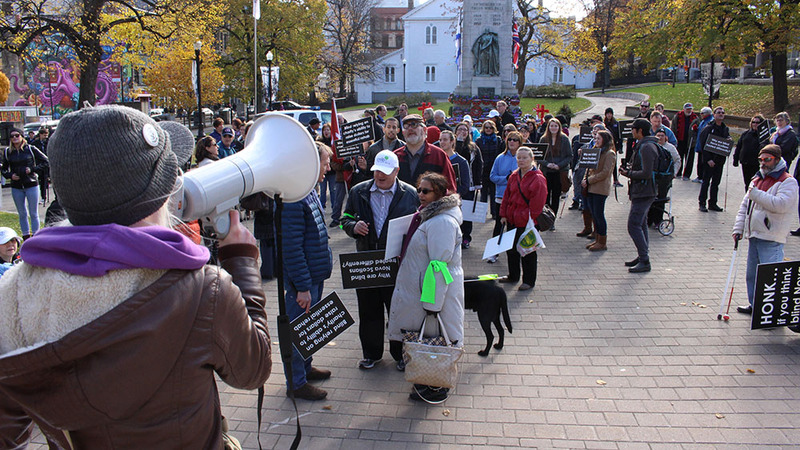 CNIB supporters marched from Grande Parade Square to Province House just after noon on Nov. 12, yelling. 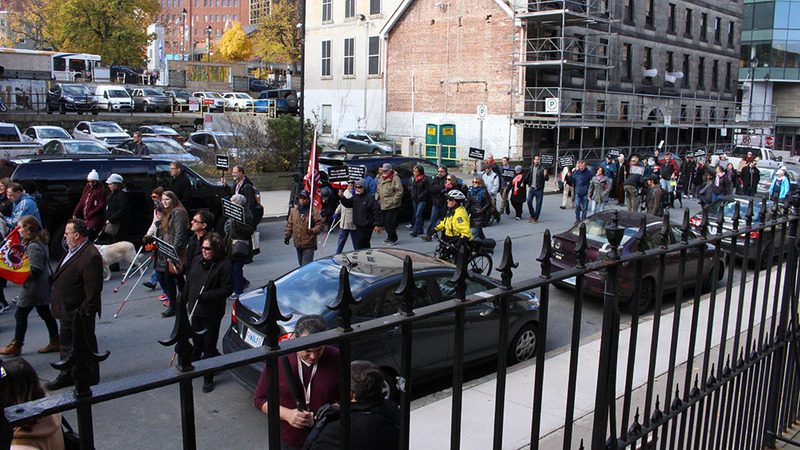 Their shouts could be heard within Province House as the legislature opened. The supporters continued shouting for several hours. Health Minister Leo Glavine met with CNIB representatives later in the day. He said he wanted to clarify if Community Services and the Department of Health would provide funding in the future. 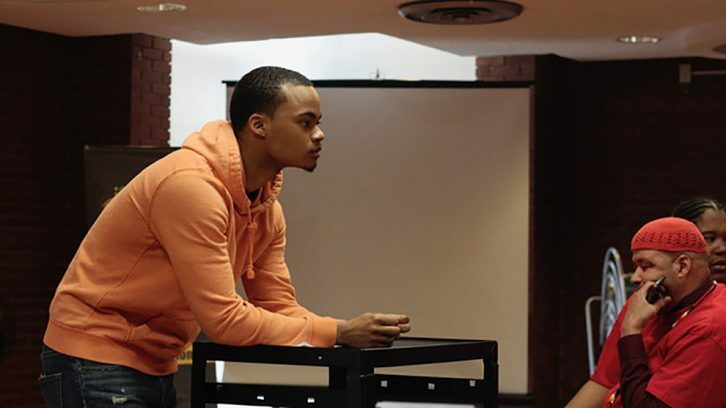 Those departments were funding the program before cuts were made. 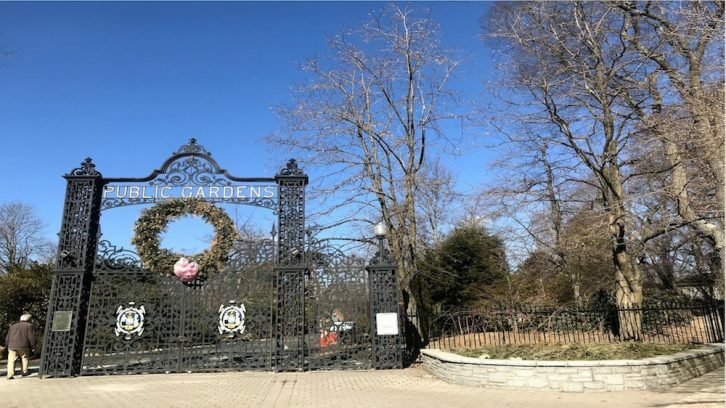 “We’ve found that the Community Services program is really not that applicable to the rehabilitation program that is of primary importance to CNIB, so it’s important that the Department of Health and Wellness become the sole means of financing the rehab program for CNIB,” said Glavine. That suggests a possibility for future funding for the CNIB. When asked if more funding would come, Glavine responded that it could come in the next budget year. The CNIB says that funding is needed now. 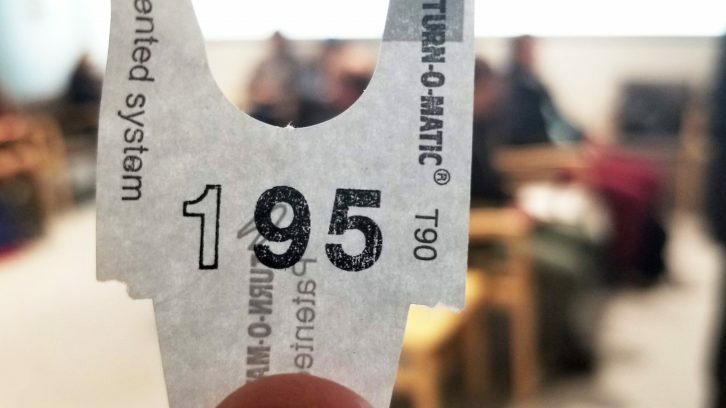 This year, it had to cut 5.25 positions. Now it is down to just six full-time mobility specialists. Gow-Boyd says more cuts are on the way. She stressed that the next step would be to cut actual services. 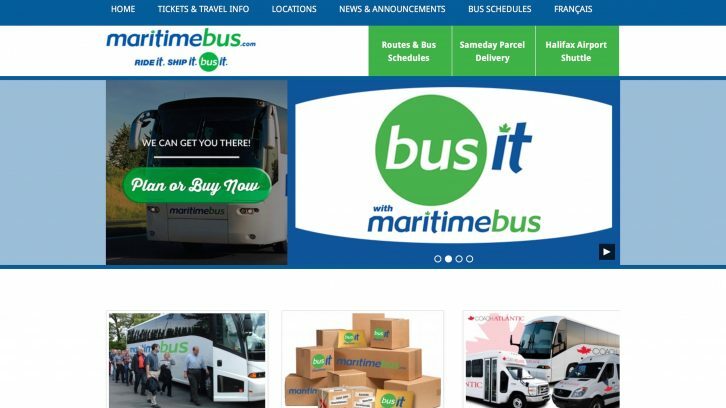 “At this point, cutting a position does not mean longer wait times; it means services that are not offered anywhere else in Nova Scotia will be eliminated,” said Gow-Boyd. 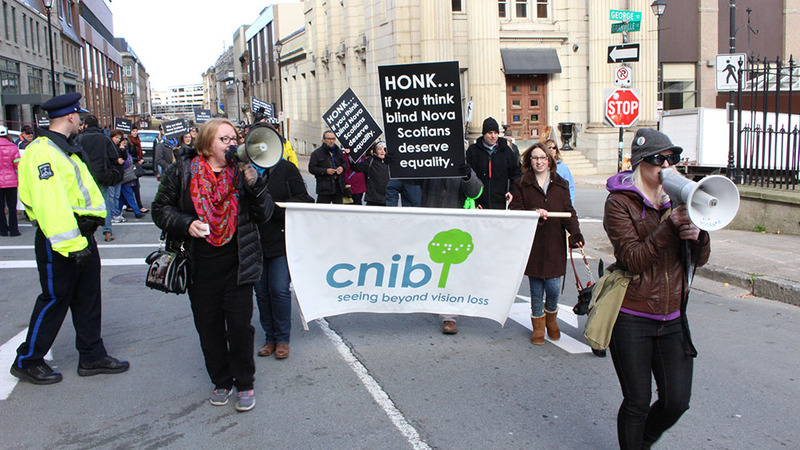 The CNIB said vision disabilities should be treated like any other disability covered by the government. Alycia Pottie went further, saying vision rehabilitation services should become a part of the Canadian health care system. 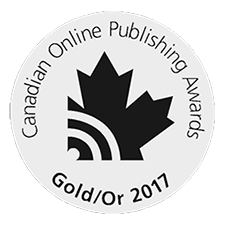 “As Canadians, we take pride in our healthcare. It’s something that we’re known for across the world. Yet this [disability] isn’t covered by the government? That’s pretty ridiculous in my opinion,” said Pottie.